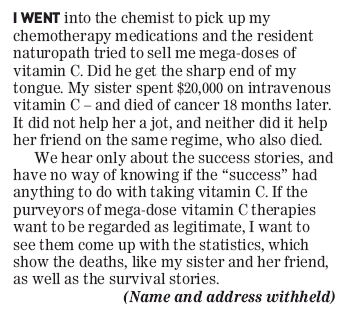 If you read today’s letters to the Sunday Star Times you’ll see the flip side of anecdotal evidence on the use of intravenous vitamin C to treat serious illness. The letter below illustrates well why it is potentially very dangerous when people make decisions that may impact their health based on anecdotal evidence. Miraculous recoveries and “miracle cures” get all the headlines as the 60 Minutes piece from last week that was the subject of an earlier post shows. What doesn’t get reported, unless they go horribly wrong, are the ineffective and often expensive alternative treatments people and their families resort to when they are near death. On a side-note, who’d have thought this stuff would be so expensive and why was the writer greeted by a “resident naturopath” at their local chemist?Is that, like, normal? thanks Ken, I’d wondered what had happened to the High Priest of pseudoscience… interesting cherry-picking from him once again.